With all the criticism Microsoft is getting for releasing Windows 8, can OS X Mountain Lion be the best operating system? 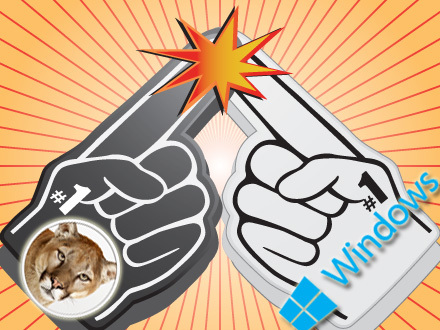 The final version of Windows 8 is complete, how will it compare to Apple’s very popular, Mountain Lion? In my opinion, not well. Apple’s operating system has its downfalls and Windows 8 has its unique aspects, but overall I believe that OS X Mountain Lion will be the better operating system. First and foremost, no matter what you think about Windows 8’s design, it’s a engineering achievement. Microsoft came up with a product that’s familiar to more than a billion users, and forward-looking at the same time. That’s quite an accomplishment. However, from the user’s standpoint, Windows 8 is a failure. Its an awkward operating system that pulls the user in two directions at once. Users attracted to the new touch-friendly GUI will dislike the old touch desktop underneath. By the same token, users who rely on the traditional Windows desktop will dislike having to navigate Metro to find settings and apps they normally locate in Windows 7. For a full review of how bad Windows 8 is check this article written by Woody Leonhard from “InfoWorld“. Here is also an article written by Galen Gruman, showing how great the OS X Mountain Lion operating system is. Now let’s get back to the topic at hand. Which operating system has the better ease of use for its consumers? I will give a score of 5 for Windows 8 and a score of 9 for Mountain Lion. Apple is the same as it was 28 years ago. The user face is more defined than it has ever been but the core of the operating system has not changed, which makes users come back to it because they know what to expect. The OS has expanded to support touch gestures in a very natural way, via touch mice and touch-pads. Also, Apple’s new helper utilities, such as the Quick Look preview facility, the new Notification Center, the new sharing capabilities, and the Spotlight search tool; do what Apple does best. Most importantly, OS X Lion lets users stay focused when they want to be, yet have quick access to the rest of the OS as desired. As an example of an unfriendly change in Windows 8, Microsoft has added the ribbon to the Windows Explorer file manager. But unlike the ribbon in other apps, the one in Windows Explorer is hidden until you click or tap the corresponding menu. The bone-When the ribbon displays, it overlays part of your content window, not showing whatever is at the top. Fortunately, you can turn off this auto-hide functionality and make Windows Explorer’s ribbon work like all other apps’ ribbons. By contrast, the Metro part of Windows 8 can be downright elegant in its simplicity, focus, and use of imagery, without distracting chrome such as window frames and menus. It makes Windows 7 look dowdy and archaic. There are just two ways to get app options that aren’t in the app’s screens, and they’re easily accessed through gestures. But if you use a mouse and keyboard which most people do, accessing the common search, sharing, and settings services (called “charms”) involves an awkward action. And if you don’t have a physical keyboard, such as for a tablet, there are some Metro features you simply can’t use, such as searching for an app by typing its name in the Start screen, because there’s no way to invoke the onscreen keyboard instead. The Windows Desktop part is the Windows 7 you know and probably love. The changes to this environment are insignificant, beyond the ill-advised ribbon change and a nice-looking Task Manager. Until you double-click a file and find it opens a Metro app instead of a traditional Windows one. Microsoft wants people to switch to Metro, so it has set the default core apps such as email and media players to be the Metro versions. Just as Metro works nicely via touch and poorly via traditional input methods, Windows Desktop works nicely via traditional input methods and poorly via touch. Icons and menus are too small to read on a tablet screen, and too hard to touch or tap reliably. Plus, touch equivalents for common actions such as right-clicking do not work reliably in the Windows Desktop. Ultimately, you’re switching between two different computers that share a file system and a few core services, and each computer is optimized for a different set of input methods. It would have been better to leave Metro for tablets and Windows 7 for laptops and desktop PCs, and slowly merged the UIs as Apple is doing with OS X and iOS. For most users, Windows 8 will be a confounding mess. OS X wins for user friendliness, who will win for features, manageability and security? Continue here.